With so many portable hard drives to choose from it's not easy for a new release to stand out from the crowd, but Western Digital's My Passport Studio 640GB succeeds admirably with an interesting feature that's more than just a gimmick. The new drive, which is preformatted for Mac and also available in 320 and 500GB capacities, features a small display screen based on e-ink technology. You can customise it with your own 12-character label, and a graphic shows how much free space is available. Because it uses e-ink, it remains on even when your drive isn't powered. The label is edited using WD's SmartWare drive management app, which also lets you password protect the drive using 256-bit encryption and back up your files. It's easy to use, and accessible through a menu bar icon. A turbo driver for faster copying is also included. Connectiviy is through USB 2.0 and FireWire 800, with a bundled cable for a FireWire 400 port. 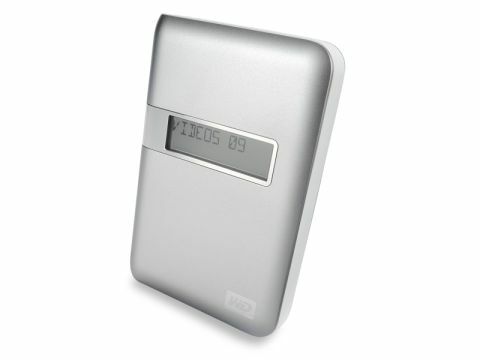 The drive label is an excellent idea, making great use of e-ink technology. The capacity gauge is handy too, but it disappears if you use the drive on a computer that hasn't got SmartWare installed, limiting its usefulness on a portable device. Also, the drive uses the emerging but currently uncommon Micro USB standard, which could prove inconvenient if you haven't got the bundled lead with you. Even so, it's great to see someone doing something different and inexpensive with the portable hard drive.